You know what? On a recent trip to Vivocity, I made a startling revelation. I couldn’t find a single nice and unique cafe to sit down and have a cuppa! I came across Coffee Bean, Gloria Jeans, 2 Starbucks (! ), Tom n Toms etc but these you can find in many locations around Singapore. I wanted to experience something different! Alas, I had no choice but to finally settle for Max Brenner Chocolate Bar. At least, they only have one other outlet which is at Esplanade. 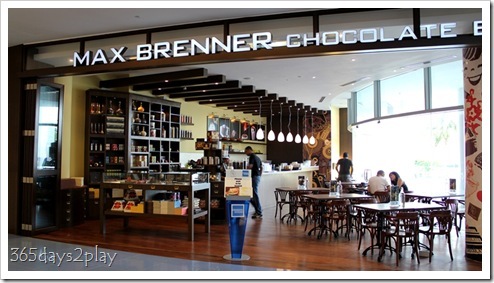 The thing I know about Max Brenner is that their expertise is in chocolate and chocolate drinks. I think they serve one of the best chocolate drinks in Singapore – the Pure Chocolate Truffle Granita Drink. 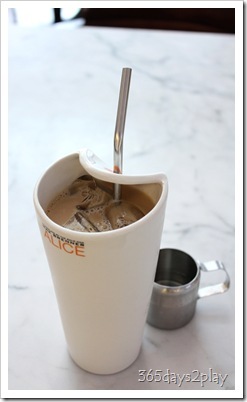 It costs about $7.50 and is 1 tall glass of pure rich and sweet chocolatey goodness blended with ice. 1 glass of that fills me up so much I normally have to split it with another person. I still get 100% of the happiness though. Well that’s what I would have definitely ordered at Max Brenner, had I been hankering for something chocolaty. BUT, it was 4pm and a coffee was in order. So we decided to order their iced cafe latte. 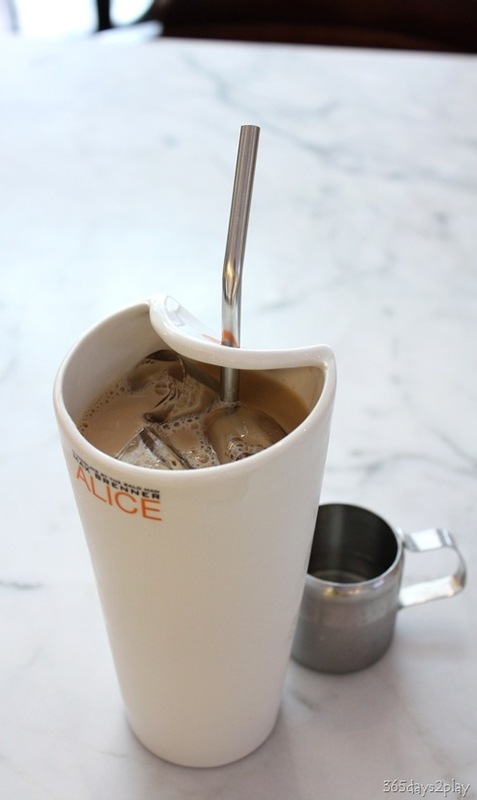 The iced cafe latte was served in their signature Alice Cup, with metal straw. I was wondering who Alice was the whole time there. The Partner lost no time in humming the song “Who the F*** is Alice” to irritate me. Well I googled and the Alice so referred to is Alice of Wonderland. 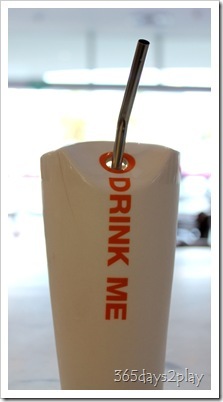 No wonder the glass says Drink Me! The iced latte was not bad but not strong enough. At least it had a smooth taste. And because the sugar syrup was not pre-added, we didn’t end up with a sickly sweet drink. 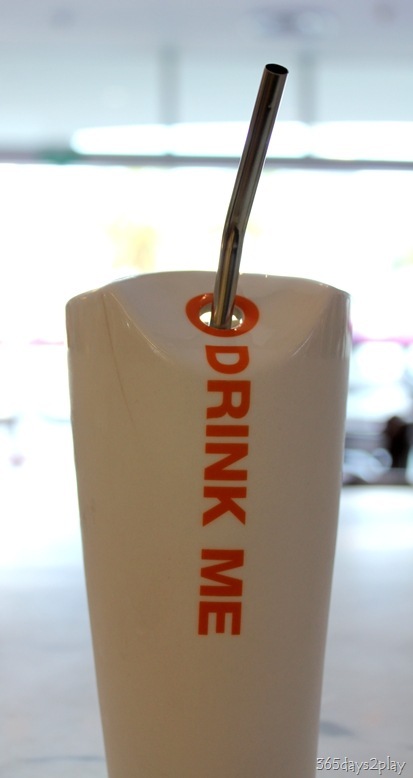 Still, I would recommend ordering their Pure Chocolate Truffle Granita Drink if you’ve never tried Max Brenner before. That, in my opinion is their best drink in the house by far. « The Farmer’s Market is on again tomorrow! I must have made a mistake the last time. I don’t think I ordered the pure chocolate.